Following his bad crash at last year's Tour de France, Jurgen Van Den Broeck is trying to return to his best form. After crashing out of the Tirreno-Adriatico, he finally managed to finish a WorldTour race in last week's Volta a Catalunya and while he didn't feature at the pointy end of the GC, his Lotto Belisol team were happy with their showing. A stage with start and finish in Barcelona closed the Volta a Catalunya yesterday. After a run-up of 71.5 kilometers there were eight local laps of five kilometers in the Catalan capital with the ascent of the Montjuïc. The circuit was shortened one kilometer because of the rain. Boris Vallée joined a break just like in the first stage. Lotto Belisol animated the first stage because of the presence of Boris Vallée in the front group. The young Walloon and his companion Lemarchand didn't make it to the end, but Vallee could wear the jersey of the intermediate sprints classification for the next two days. Yesterday Boris attacked again, this time with twelve others. In the second local lap the front group split in two and Vallee was dropped. Lieuwe Westra could stay ahead and won. Joaquim Rodriguez is the overall winner. 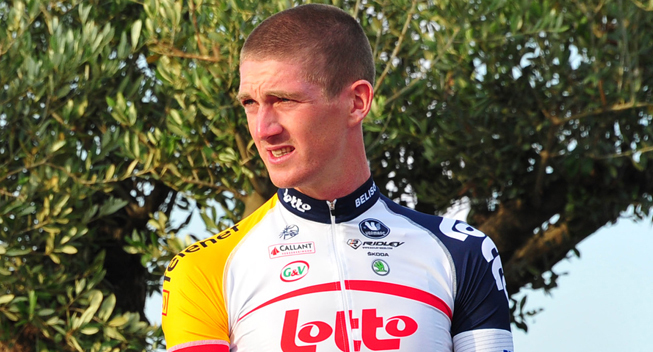 Sander Armée is the first Lotto Belisol rider in GC on the 19th place at 1'58" of the Spaniard. Tosh Van der Sande was fifth on Monday in the bunch sprint. A day later he lost the wheel of Boris Vallée in the sprint and found him back too late. Van der Sande got eight behind his teammate. Friday Van der Sande rode in the top ten again, he was ninth. Yesterday the 23-year old rider won the peloton sprint for the tenth place. "It was very strong of the 20-year-old Boris Vallée to attack on the last day," sports director Mario Aerts said. "The course was actually too hard for him in the local laps, but he did it well. He rode a very good Volta a Catalunya, this looks good for the future. "We are also very satisfied about Tosh Van der Sande, who took several places in top ten here in Spain. He's better uphill than last season and is very attentive in the race. "The knee of Jurgen Van den Broeck has healed well, but he misses some competition rhythm. It's good he rode here and his next job will be in the Vuelta al País Vasco."